I am delighted with my first ever Jag, an 16 Premium Luxury. It was bought from an independent dealer with 27k miles on the clock. So far it has performed faultlessly and I am still grinning. After reference to this forum and some discussion with Jaguar Customer services who have by and large been helpful, I have managed to set up my InControl Account and Navigation services so there are lots of new features to play around with. The only problem is that I cannot get live traffic on the sat nav or 'precondition' the car remotely. I have Live working with an EE SIM card. Jaguar have told me that my car should have the InControl pro services available however this does not appear to be the case. When I log into Jaguar Here navigation, if I go to Maps and services there is the option of a Services Subscription of a year for £89.00. So, my question to the forum experts is: Do I need a services subscription to activate the InControl Pro services? Alternatively, am I missing something? BTW My nearest Jag dealer is 30 miles away, so a quick trip to them is not possible. Is that a typo ‘06 premium luxury’ as that is the previous model and doesn’t have any of the incontrol features. Connected navigation services is to do with the route planner app which allows you to send routes to your car and live traffic information not free maps. B*gger, first post first typo that should have been 16 so I have edited post. Car is now three years old, so it looks as if I am going to have to renew the navigation services. There is a 3 year option for £129.00. 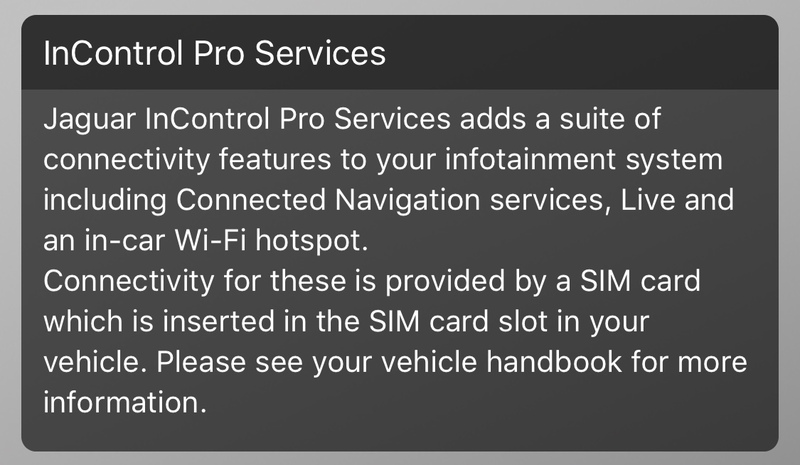 Live and in-car wi-fi hotspot are working, so it looks as though it is only some of the proservices that require a subscription. The more I investigaye the more confused I get - not difficult. My InControl dashboard shows 3 services: Incontrol Protect, Incontrol remote premium and Incontrol Pro Services. All of these are showing as expired. I cannot find a way on the Incontrol website to subscribe to these services. Am I missing something? Also, if I subscribe to the Incontrol Pro Services does this provide me with the traffic info that I am keen on getting, or do I need to subscribe through the Touch Pro Navigation Maps and Services? The link below explains everything you need to know about Jaguar in-control services. Speak to your dealer about renewing iirc it’s £30 a year.